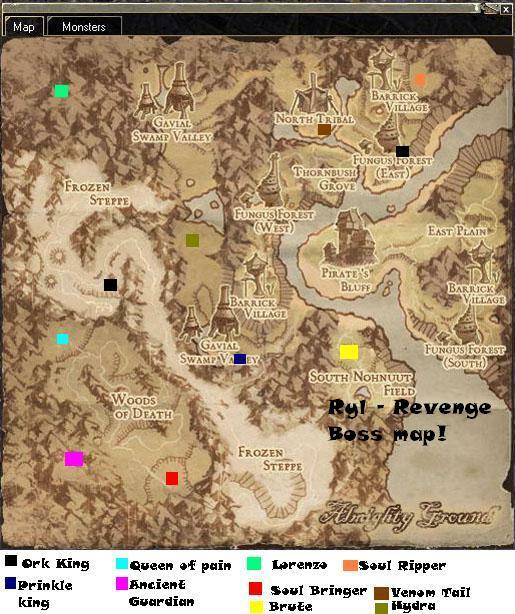 Hi and Welcome to RYL2-Revenge Server! 3. )Download the GamePatch, if the autopatch give errors, and extract the files in the main game directory. 4. )Double Click on the game.. You can play now! Enjoy! MOUNTS RELESED! YES MOUNTS ON RYL REVENGE AND WITHOUTH ROW OR RYL1 ENGNE. OUR MOUNTS CAN ALSO FIGHT! NEW SPECIAL ABILITY ARMOR ADDED Hero Armors, Imperial Armors Gold and Imperial Armors Silver got the ability to absorbe a percentage of melee dmg ! NOW HEROES ARE REAL HEROES! Totally NEW SKILLS REELASED FOR GUNNER,WARRIOR,TEMPLAR AND PRIESTS ENJOY! NEW PVP MAP ADDED! GO FIGHT FOR YOUR POTIONS IN HELL GATE ! Game Guard removed and Anti-Cheat + Logging engine added. Overkill bug removed - you now hit 65535 dmg max. Map4 Hells Gate and new monsters/bosses added. Buff bots added in map3 - defense, mana cell, encourage, and weapon buff - all last 1+ hr. 1 billion gold tickets added to Imperial Merchant to allow mass gold storage/trade. 4 Statue Wars a day - 1 hour 20 minutes each. Statue defense increased in map3. Guard npc's at statues added - you can buy guards for your statue. 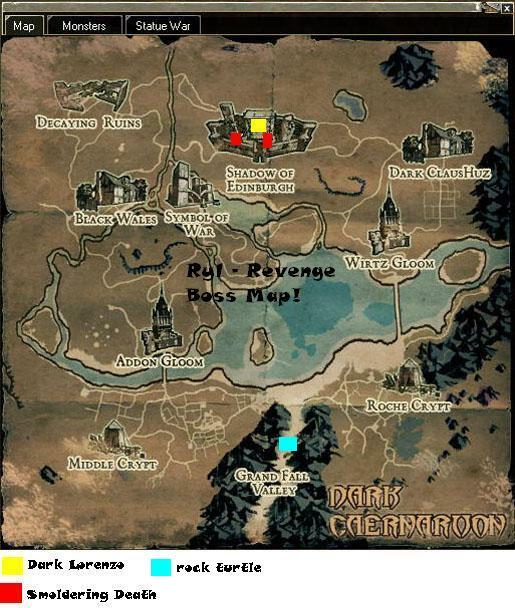 Teleport Scrolls work in all maps. All metals drop including Scrap Metals, Ancient Metals (TOBS), and Antonium. Alchemy added - you can now make better metals from lesser metals. MeDal merchant added to sell special items. Monster drops include metal boxes, gold boxes, L gems, G hp/mp/dmg potions, cupids, and A gear. Boss drops include 1b tickets, soul items, special teddy bears, and valuable reward boxes. Prinkle bosses added - they drop new cakes that heal you 8888hp and 8888mp. Custom bosses added in all maps - some easy, some need a hero! 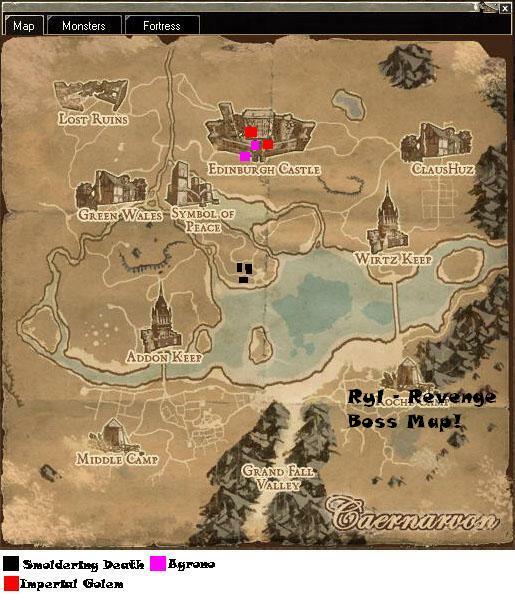 Forum based game guides help you will all aspects of RYL Revenge - no need to wait for answers! Many guides (staff members) to help you in game and prevent abuse/exploits/hacking. Permissions based staff hierarchy means NO CORRUPTION or gm items. Imperial armors and arms/gloves added - will allow you to have 6595 def armors. Soul metals and Imperial metals added - use these with new items and upgrade system. Soul Helm and quest added - you can upgrade it to +30! Soul jewlery added - you can upgrade to +30! Magic, Defense, Damage, and Critical class soul jewls added. Hero upgrading system and Hero Stones added - you can upgrade soul items to +35! Hero items and quest added - allows you to make hero items. Noob necklace added with 300 dmg, 300 magic, and 300 crit in general store. Special pumpkin helms added into economy. Donation items available - these items still keep balance and fairness. Level 5 skills and quest added - allows you to make lvl 5 skill books. Level 3 books available in NPC's. All skills adjusted to balance classes/monsters/bosses damage. 1 hit kills fixed -- more dynamic and fair PVP now. Dagger launch skill adjusted to be effective. Life rob skill (defender) adjusted and capped - you can damage/heal for 25k. Power drain skill capped - you can damage/heal for 32k. Vampire kiss adjusted depending on enemy Magic resistance now. First aid skill heal reduced to 18k. Nimble strike skill reduced cooldown to match forceful blow. Chain reaction skill increased cooldown to match forceful blow. Stun added to runes shock skill. 1. )Another new Quests will be added!